The Second Problem I Hear Dentists Complain About. Last week I wrote about Dentists having no time to do dentistry, run their business and keep everyone happy! Dentists are also very concerned that they just don’t have enough New Patients. I know because many Dentists tell me this! They are looking for a solution to this problem. Having a healthy number of New Patients is essential to every Dental Practice. These New Patients turn into long term existing patients, referring patients and allow for the natural attrition of your existing patients. I do hear some dentists say they don’t need any more New Patients but I am always a little concerned at this type of confidence. Most of the time the Dentist is not quite sure. They seem to have a rough idea but don’t know the actual number. I explain to them that once they know how many calls are being converted to New Patient Appointments and how many of these appointments are kept appointments, then they know the reason why they don’t have enough New Patients. I am always surprised at how many calls are actually being received and how many do not become appointments. Well that is not true. I am actually not surprised. I see so many teams struggling on calls, trying their best but just not knowing what to say and ask the caller. The number of New Patient Appointments made is directly related to how well the person answers the calls in your office. Do you know how well your team are answering the calls? If you don’t then you should. 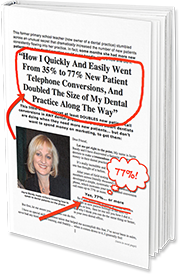 If you have a low number of New Patients and you are getting plenty of calls coming into your practice then the problem is the calls are just not being converted to appointments. Once you know this is the reason you have very few New Patients then it is time to do something about it. You knew I would say this. I have seen the change in New Patient numbers once your team know what to say on the New Patient Call and how to make sure the call turns into an appointment being made. It just makes sense, yet I see Dentists continue to scratch their heads wondering why they have very few New Patients. So start tracking those calls. Know how many and then look at your New Patient numbers. If it doesn’t add up then you can do something about it.